That’s not quite what happened. It wasn’t “some” will murmur and find fault; “some will grow angry; and “some” will become persecutors, but the numbers of those who disapproved of the new book were beyond all expectations. The letter from David Kihlgren sent in 1918 to August Lundborg in Sweden is an example of the dissatisfaction of Bible Students with the book, the use of it, and the conduct of the then present “Directors” in relation to Pastor Russell’s will which in Kihlgren and Lundborg’s case, caused them to leave the Bible Student’s movement. The following unpretentious translation was made in December, 1976 from the letter as published. The pages in I Morgonvakten are indicated. Underlined words in the translation are specially marked in I Morgonvakten. Beloved brother Lundborg! Greetings of peace! It is a long time now since you received a letter from me, and I suppose you have wondered why I have kept silent for so long. But first I want to thank you, my dear friend, for sending me Vakt-Tornet (Swedish W.T.) for this year also, although I have not subscribed to it for this year, either for myself or for our (Sr Kihlgren’s and mine) relatives in Sweden, as I used to do. I should have written to you long ago and told you why I have not subscribed this time, but I have always postponed writing you, as it deeply hurts, when remembering the faithful friendship and intimate love you and I have always enjoyed, to be forced to confess that I see things differently than you in relation to the Watch Tower Bible and Tract Society after brother Russell’s death. This statement of mine is applicable particularly to the 7th Volume, “The Finished Mystery”, in addition to the use made of it (at least in this country) and the conduct of the present “directors”, which is in apparent conflict with brother Russell’s last Will and Testament in essential points. During all the many years the Lord has granted me the invaluable advantage of rejoicing in the light of the present truth, to which light I have been guided by the writings of brother Russell, yet I never received a single one of his presentations of doctrine without first having tested them for myself, that I for that reason could make them my own. When the seventh volume was released I received it “with open arms”, without any prejudice or suspicion. When I held the book in my hand for the first time I felt like this: “Lord, now lettest thou thy servant depart in peace, for now I have seen the seventh volume — the last meal on the pilgrimage”. I read it, studied it, in exactly the same manner as formerly the first six volumes, when they came out by turns, testing everything in order to, discern and keep that which is good. 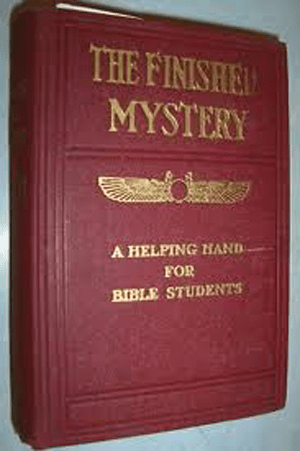 While doing this, however, I gradually, though reluctantly, was brought to the conviction that Volume VII was not what it claimed to be, namely 1) “The posthumous work of Pastor Russell”, 2) “The Penny”, 3) “The Winepress”, 4) “The Fiery Chariot”, 5) “The Seventh Vial”, 6) “The Mantle”, etc., etc. I accept it for what it is, but not for what it claims to be. In certain respects it is a valuable book, particularly because brother Russell’s statements on Revelation are compiled in it. Besides, I respect the book as an attempt of two consecrated and talented brothers to give us the best explanation they were able on the particular books of the Bible they deal with and interpret in it. But not so small a portion of it is of speculative nature, which history already has “begun” to disprove. On the other hand these dear brothers have presented many beautiful thoughts. Thus, I don’t reject the book as a whole, but what I as a Christian and as an elder have to most resolutely oppose is the fact that the headquarters has attempted, to force upon us this book as an authority equal to (if not, to be plain, superior to) the first six volumes of Studies in the Scriptures. The Watch Tower has in plain and determined words pointed out to the local classes that they should not elect anyone as elder not fully and wholly accepting the seventh volume and not anyone, either, who has not got his ordination (the mark on answering the V.D.M. questions) from the headquarters. This fact, that a central power is beginning to dictate and prescribe with authority what the local classes should do in their own affairs and the fact that the local classes really do bow down at these demands — this, my dear brother, to me seems to be a complete revival of the old sectarianism in a new shape. The seventh volume has been made a denominational creed and the passing of the answers to the V.D.M. questions constitutes the ordination. The majority (about two thirds) of the class here in Springfield took a neutral stand to the Seventh Volume. At our latest annual meeting it was decided and emphasized that in the Pastoral Work (that is the general distribution of books done by the class) everyone could choose either to use and sell all the seven volumes, or just the six first, or only the seventh — all in harmony with each worker’s own desire. But when the reports from the meeting reached the headquarters in usual order, they were not satisfied with what had been decided, but, as the highest leadership realized it could not induce the majority to specially “push” the 7th Volume, a pilgrim was sent here, who from the platform openly declared that all who wanted to work in harmony with the Society should go to another hall and organize a new class there. The minority then followed him there and now they are receiving the pilgrim visits while the old congregation is “cut off” from and by the Society. It was this action of the Society especially, which against my will convinced me that the Society had entered a sectarian path, penetrating into the affairs of the local classes and trying to remove from us the freedom with which Christ has made us free. I am, glad to be able to tell you that all the elders and all the deacons (except two) stayed in the old, from the Society expelled class in this town. The desire and ambition of the congregation is to go on with the activity precisely as our beloved brother Russell wanted it, pointed it out — but not as it has been perverted by the present management of the Society. Several classes here in the eastern States have endured quite similar experiences, their majorities having remained faithful to Pastor Russell’s work while their minorities have followed the present managers of the Society. Yes, my beloved brother, it is quite certain that we are now in the midst of the time of siftings. Little did I think just few years ago, while our beloved brother Russell provided us so abundantly with “meat-in-due-season”, that I ever in the depths of my heart should have to ask “What is truth?” This year, though, has been my best year of spiritual experience and lesson. Over and over again I have been driven to the throne of grace from trials of the sort mentioned above, and I have found grace, and help there. To really love the brethren costs more this year than ever before as one finds oneself so wholly and openly misjudged and misunderstood by them and denied and refused their fellowship. But by that, on the other hand, very good opportunities to practice brotherly love present themselves. I pray to God every day that he, in his own right time and in his own manner, may graciously disperse the mist now bewildering and confusing his dear consecrated children, 0 glorious day, when the Lord no longer permit anyone to “plant discord amongst brethren”. Sister Kihlgren is attending the new class, I the old one, and Elin (our daughter) sometimes attends one class, sometimes the other. So you see that “everyone has turned to his own way”. But, admittedly, I feel it sometimes. This has been done, no doubt, as sincere as the eleven apostles’ choice of the twelfth — but, still, it was wrong. In his great goodness the Lord did not reproach the eleven for their venture but he simply ignored their choice. We also know that the same loving Father will, even now, in his love, ignore everything in these brothers’ actions which he cannot approve of. How ardently I wish that the present reverses of the Society may open the eyes of its leaders so that the Society and its work will be brought back to the path where brother Russell left it. But this, in fact, is more than I dare hope for. I am sure of one thing, and that is that if the Lord’s consecrated will stay in the flesh for some time still (at present it seems that they will) and if our hands will not be “tied” and the doors of opportunities will not get closed, the Lord, no doubt, will use some organization, either the present Society IF REFORMED FIRST, or some other organization of God’s consecrated children. It is not our work, however, but the Lord’s. If just now we cannot fish, yet we may not be idle but repair our nets instead (keep on studying the present truth, and fill our minds and hearts with it), so that we can be well prepared whenever the Lord will use us. Of course, we can always witness about the Lord in more private ways, but I mean that if some more general work is to be done by God’s people in common, an organization that serves but not dictates or commands anyone will be required. David Kihlgren, — Mass., U.S.A.
excellent insight into the deep rift after Russells death-and how each study group was independant in most waysexcept for following to the T all of the first 6volumes—the comments of the writer that he wished to REMAIN IN THE FREEDOM OF CHRIST.and that the Society was trying to alter that is noteworthy. Pilgrim was the older word for circuit overseer I guess at that time.